The 2018 Sigma Zeta National Convention Service Committee selected the theme of Shedding light on possibilities of science by inspiring underprivileged and underserved children through science education as an avenue out of poverty. Share what your local chapter is doing to promote science education in your communities.. The 2017 Sigma Zeta National Convention Service Committee decided upon the theme of Highlighting the impact of science on everyday life. We recognize that in these troubled times, that there exists an increasing gap between the non-scientist and the scientist and we hope each chapter takes up the challenge of undertaking projects highlighting to all, the importance of science in everyday life. The ubiquity of science is evident in everything we do whether it be in the products we use or the phenomena we see around and it is our hope that we can use this to build connections with our non-scientist colleagues, friends and communities. We should seek to share not only our knowledge of the science around us but also our passion and the sense of wonder we all experience in what we do and use this to showcase the importance of science to everyone. We should remain mindful of the wealth of resources available in how to communicate effectively with our communities and it is hoped through this, we also gain a new perspective ourselves on the importance of science. We would also task those undertaking projects under this banner to incorporate both mathematics and engineering wherever relevant to strengthen the connection of all aspects of the STEM field. We would like to propose specific challenges of reaching out on our campuses to the non-STEM disciplines and showcasing the underlying science in these fields and where relevant other extra-curricular activities along with the challenge of creating activities based around the theme of a day without science, an opportunity to reflect on what our lives would be like in the absence of scientific progress. Share what your local chapter is doing to promote scientific awareness in our communities.. The 2016 Sigma Zeta National Convention Service Committee decided upon the theme of Promoting Scientific Awareness in Our Communities. We desire that each chapter seek to earnestly engage both their campus and local community, with the aim of instilling an awareness and appreciation for the intellectual and societal benefits of the various scientific disciplines represented within Sigma Zeta. Scientific literacy must be stressed as not only an essential component of a liberal education on our college campuses, but as foundational for meaningful engagement with a world in which science and technology are ubiquitous and largely unavoidable. We must strive to provide individuals with the capacity and context to rationally engage with current events ranging from environmental concerns to bioethics, and to look past common misconceptions and stereotypes regarding the nature of scientific research. Mending the rift between the scientific community and public opinion is critical if the applied benefits of scientific research are to be fully realized and embraced within our communities. Furthermore, we must strive to inculcate a sense of wonder and awe for the natural world that surrounds us, and emphasize that this appreciation can be most fully realized through the lens of the scientist. This is the surest means of encouraging future generations to continue the quest for intellectual and societal advancements reaped through scientific discovery, and will serve as an avenue for increasing cooperation between the scientific community and the general public. We must engage, empower, and embrace our local communities with scientific education as our singular aim. The 2015 National Convention Service Committee selected the theme of "Developing a Culture of Sustainability". We want our chapters to be committed to researching sustainable and renewable solutions and fostering educational outreach within our communities. Communities not only being our local chapters but also our local communities and our local youth. We want the research our members do to lead to more sustainable renewable and efficient processes in the lab. Outside the lab, our outreach impacts the community. For example, urban gardens provide sustainable organic food sources to residents of Nashville TN, science fairs throughout the country engage elementary school students with global issues and sustainable projects lead to renewal and nature within our own chapters. Each chapter can engage sustainability for the 2015 - 2016 year as the local chapter sees best fits in their local communities. The 2014 National Convention Service Committee selected the theme of "Sharing the Human Side of Science". The theme was inspired by the presentation of keynote speaker, Dr. Richard Peterson, who reminded us of the need to bring emotion, enthusiasm, and curiosity towards scientific outreach without forgetting our ethical responsibility to promote science as a human endeavor. 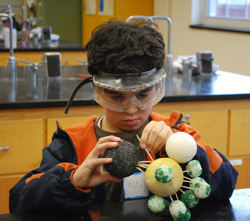 One example of the implementation of the Sigma Zeta service theme from 2013 is Asbury University's Kids College which brings kids into the University science labs for hands-on experiences with science and math. Read the March 4, 2013 Asbury University story for more information on this great example. Local chapters are encouraged to put the service theme to work on your campus in whatever creative ways fit best with your chapter, school and community. Please share your activities and projects through the website (sigmazeta.org), through Sigma Zeta on Facebook, and at the spring National Convention. The Sigma Zeta National Service Project was initiated by a vote of the 2010 National Convention with an intial theme of Community Beautification, followed in 2011 and 2012 with the theme of Inspiring Youth in Math and Science, and in 2013 with the theme of Facilitating our Youth's Interest in Mathematics and Science Through Hands-on Experience. 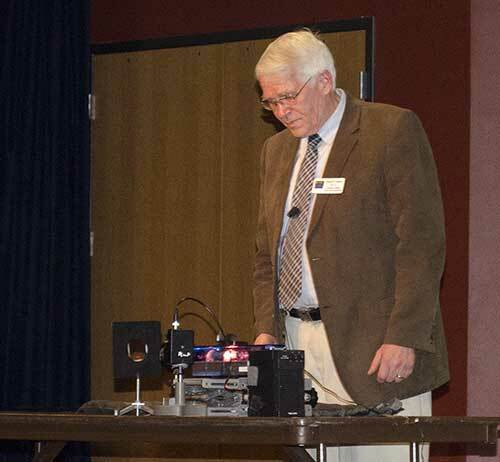 The 2014 theme of "Sharing the Human Side of Science" was inspired by the presentation of 2014 convention keynote speaker, Dr. Richard Peterson, who reminded us of the need to bring emotion, enthusiasm, and curiosity towards scientific outreach without forgetting our ethical responsibility to promote science as a human endeavor.